5-12-2003 – It could have been so easily missed. That’s what I kept thinking as I followed the intriguing tale behind a magnificent new Hydrangea variety being introduced in the Twin Cities this spring by St. Paul’s Bailey Nurseries. The story begins with the particularly harsh winter of 1982, an old-fashioned earlobe-cracker featuring Arctic air that hovered over Minnesota for a month. That his neighbor’s Hydrangea bush not only bloomed the following summer, but did so in abundance, was more than an aberration; it was a downright impossibility. How many among us would have recognized this fact? Luckily for Twin Cities gardeners, the man who observed this curious occurrence of botanical blasphemy was Vern Black, and Mr. Black knew his plants. He knew that the hydrangea growing in his neighbor’s yard was Hydrangea macrophylla (Bigleaf Hydrangea), one of only four species of Hydrangea northern gardeners have a prayer of cultivating. He knew that H. macrophylla bloomed on old wood, setting its buds the previous summer, then carrying them through winter. Most important, he understood that therein lay the plant’s flaw. Reliable blooming of H. macrophylla occurred after only the mildest winters. Anytime temperatures approached minus-twenty degrees, the next season would be a crapshoot. Drop below minus-twenty, a common occurrence in Minnesota, and homeowners in possession of the species were virtually assured of yet another summer in which their Hydrangeas didn’t bloom. So there we have the puzzle piquing the curiosity of Mr. Black. How could his neighbor’s shrub possibly have bloomed? 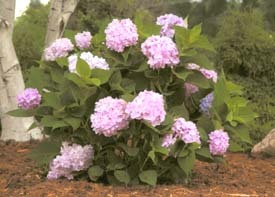 That H. macrophylla is even planted by Minnesota gardeners, considering its flaws, is attributable to the fact that, for many, it is clearly the most desirable of the four northern Hydrangea species. It has the largest, most captivating flowers. Large, oval, dark green leaves are handsome all season long. It performs equally well in full sun to part shade. And only H. macrophylla succumbs to the cute trick of blooming pink in alkaline soil, blue in acidic. 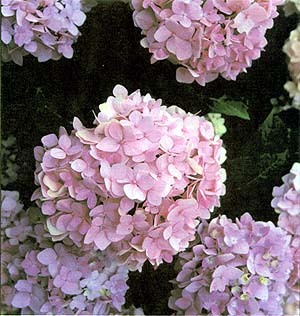 Sure, one could kiss off blue and pink blooms forever and grow the old reliable, Hydrangea arborescens, offering two varieties, ‘Annabelle’ and ‘Grandiflora,’ their dusty-white, giant mop heads of small flowers reliably blooming year after year from new, spring growth. But this is a plant you either love or hate, and most people I speak with join me in having grown tired of grandma’s bushy, droopy old mop. Hydrangea anomala, or climbing hydrangea, is a nice choice for sunny rock walls, with lovely flat clusters of white flowers and terrific, glossy leaves. Except it’s a vine, not very useful where one needs a shrub, plus it blooms on old wood; one returns to the scenario of hit-or-miss bloom. The group Hydrangea paniculata presents some worthy options. Varieties such as Pee Gee, Pee Wee, and Tardiva are all attractive, upright, shrubs for the landscape. Tall, conical clusters of flowers do the start-out-white, fade-to-dull-pink trick; alas, there’s no blue in the pallet. But at least you know you’ll get bloom – H. paniculata blooms on new wood (there’s that piece of the puzzle again). Overall a fine species, but less arresting than dear, frail Hydrangea macrophylla. Which brings us back to where we left off: Mr. Black and the Case of His Neighbor’s Curious Hydrangea. The reason Vern Black understood there was a puzzle in the first place had to do with his job at the time, Superintendent of Growing and Propagation for Bailey Nurseries. To crack the case he did what any professional plant person would do. He watched, took notes, and waited. Sure enough, this lone, strange H. macrophylla bloomed brilliantly again the next summer, and the next, harsh, windy winters be damned. One trait I admire in professional plant people is they are never in a hurry; haste is an awkward attribute within the context of plant evolution. After three years, however, even Vern had seen enough. He took a cutting from his neighbor’s plant back to his greenhouse at Bailey’s. From the start, the new, unnamed variety of H. macrophylla was a blooming superstar in Bailey Nursery test gardens. They soon understood why: The silly thing was blooming from both old and new wood. It didn’t matter if the flower buds survived winter or not; spring growth produced buds that bloomed later that same season. Then a second genetic twist appeared: Instead of one blush of bloom, the plant continued setting new buds, about every six weeks, into late summer. Genetic makeup of the mutant plant’s offspring contained botany’s Holy Grail: continuous bloom. There was also no denying that the plant had jumped a notch on the hardiness scale as well, with field specimens maturing over the years to five-feet tall and wide, suffering little winter die back. Now, after twenty years of propagation and testing, Bailey Nursery is readying a limited release of one of the planet’s newest plants: Hydrangea macrophylla ‘Bailmer’ PPAF (plant patent applied for), or Endless Summer™ Hydrangea. When I saw the plant in bloom last August it took my breath away. Eight-inch diameter clusters of vibrant pink blooms are nicely spaced throughout the dense green foliage. In acidic soils (pH 5.5 or lower), bloom color is a clear, sky-blue. The plant performs well in full sun to dappled shade. Hydrangeas need ample moisture but do not like wet feet; a well-draining, sandy loam soil is ideal. The plant will be available this spring in small quantities at a few select nurseries in the metro area. A major national release is scheduled for spring, 2004. Word of the new plant is spreading across the nursery industry, and experts travelling to St. Paul to examine the plant agree that the Endless SummerÔ Hydrangea is one of the most significant new shrub introductions of the past twenty-five years.